This past Saturday, Broner reportedly found himself in handcuffs after jaywalking in Miami while hanging out with fellow fighter Gervonta Davis. According to TMZ, “Adrien got angry and smacked the hood of the car and began yelling at the driver.” Nearby policemen reportedly asked Broner to tone it down, only to get yelled at by the boisterous fighter. Hence, the handcuffs. Needless to say, Broner was let go without being arrested, and made his way a nightclub called “Exchange Miami.” TMZ also reports that, on Friday evening, Broner was denied entrance to a club called Voodoo – though the reason why remains unclear. Earlier in the week, Broner was accused by a social media figure named Andrew C. Caldwell of what TMZ calls “flirting with him.” Rather than strongly denying the accusation in a way one might expect, Broner responded in a rant that indicated he would physically harm any homosexual who touched him. This, of course, led to a backlash, and to Caldwell getting a restraining order against the fighter. Coupled with an arrest warrant that was handed down shortly after the Pacquiao fight for neglecting to show up in court, and this latest batch of Broner news is far from good. With that in mind, it’s worth noting that Broner is now almost as famous for his antics as he is for his ring acumen. Once considered one of the rising stars in the sport Broner has leveled out as a gritty opponent with a big mouth who can most likely best all but the best names in the game. 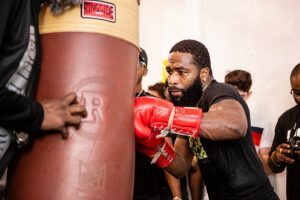 His engaging ring style, coupled with his notorious reputation, allows Broner to still get lucrative fights, but it has now been some time since he’s been considered a fighter of particular note.